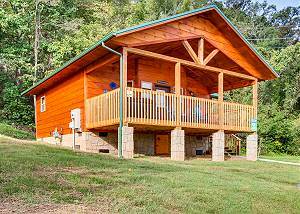 River Getaway is exclusive, romantic, brand new log cabin in Pigeon Forge with BIG screen TVs, King Premium Bed, riverfront views!. Perfect for all occasions!... VIEW NOW. 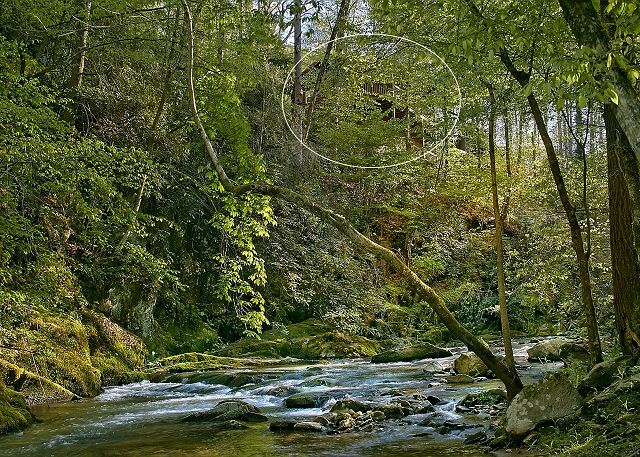 Whispering Waters #208 is a two-bedroom, two bath luxury cabin nestled on a one acre lot at the base of a mountain that overlooks beautiful Cove Creek. Its tasteful landscaping with huge boulders and towering trees is a nature lovers dream located in Wears Valley. 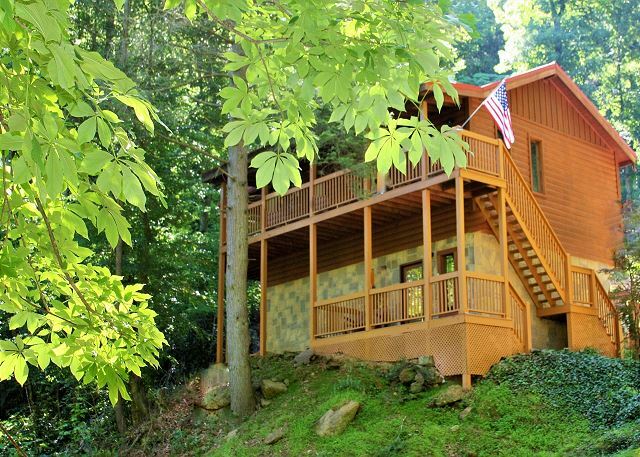 Tucked in the mountains and surrounded by wooded views, this Creekside cabin offers a peaceful getaway for family and friends. 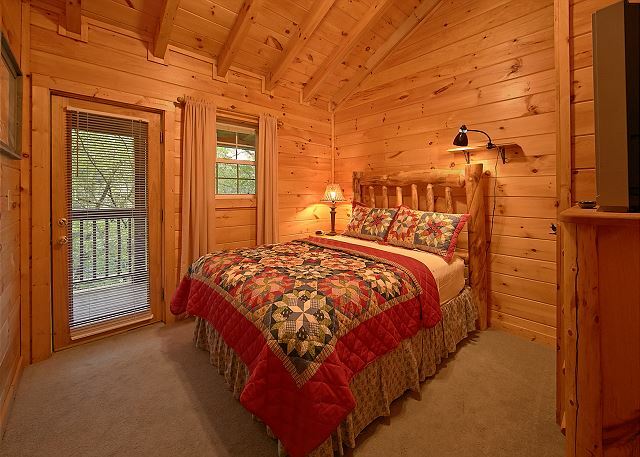 Located approximately 15 minutes from Townsend, 10 minutes from Pigeon Forge, and 20 minutes from Gatlinburg. This cabin has a gravel road leading up to the driveway that has inclines and would not be considered motorcycle or trailer friendly. There is available parking for up to 2 vehicles. 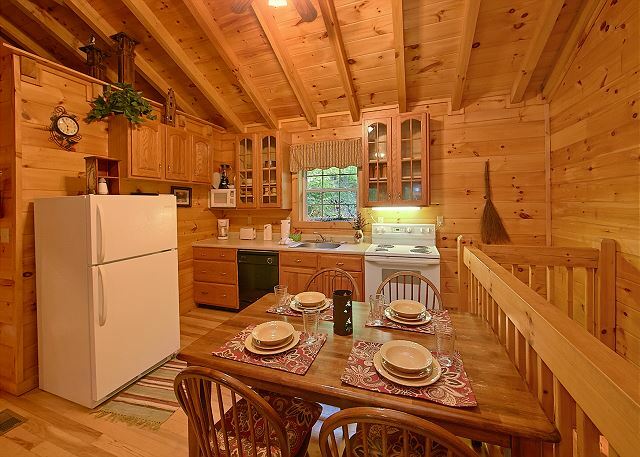 This 2 story, 2 bedroom 2 bathroom cabin sleeps up to 6 people. You enter on the lower level where you will find a game room with a Pool table, bar seating, Queen sofa sleeper, Washer & Dryer, & a Flat screen TV. On the upper level, you will find a full kitchen with dining for 5. The Living room offers high vaulted ceilings, a Queen sofa sleeper, and chair. There are 2 bedrooms, each with a private bath with a shower tub combo. One King & One Queen bedroom each offer a Flat screen TV. The main level deck offers rocking chairs to enjoy with your morning coffee or just relax and take in the sounds of nature and the flowing river that surrounds you. There is also a Hot tub, perfect for relaxing and unwinding in at the end of the day. 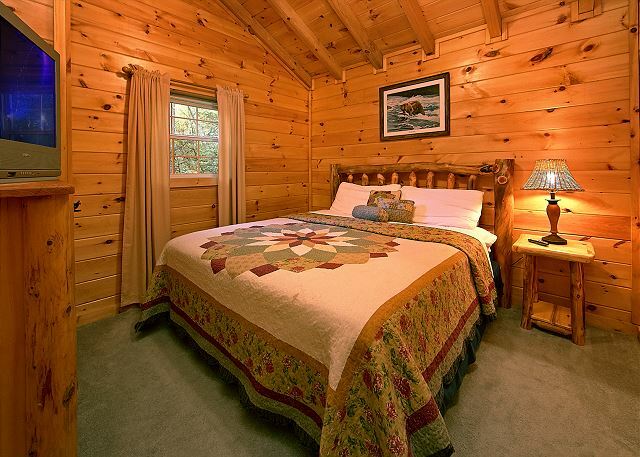 If you are wanting a peaceful and relaxing vacation, then "Whispering Waters" is the perfect cabin for your next mountain vacation. What are you waiting for? 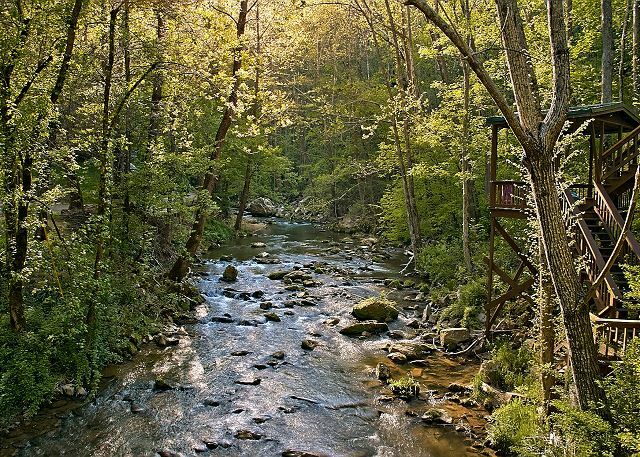 Book "Whispering Waters" and enjoy the peaceful sounds of this beautiful wooded Creekside cabin! Nearby Attractions Great Smoky Mountains, Hiking, Fishing, Shopping, Ziplining, Horseback Riding, Tubing, Kayaking, Swimming, Waterfalls, Go Karts, Putt Putt, Laser Tag, Snow Skiing, Water Skiing, Trails, Amusement parks, Water parks, Fly fishing, Caves, Caverns, Outdoor activities. Sightseeing, Family fun. We had a wonderful time. The cabin was amazing! We really wish the Christmas decorations we not still up in March... Other than that it was perfect! It was a beautiful cabin and the creek next to it was so much fun for the kids to play in. We had a great time. It was clean, the staff were very nice. I couldn’t have asked for a better place to stay, it felt like home. Great Family retreat. Peaceful sound of the stream below, and comfortable accommodations. Close enough to the grand strand but far enough away for solitude. My wife and I and our children had a really nice time during our week stay at this cabin. It was an absolute gem! Traveling as a family of 4, it was cozy, yet with the game room being downstairs gave the space a spacious feeling. Not as secluded as expected by the photos shown, but none the less far away enough from neighbors to be very private. Besides the Christmas decor still being up in mid-February, everything was exactly as expected, clean, warm, and very welcoming. The staff was also very helpful with any questions we had. We will totally be back! This cabin is beautiful and the setting is breathtaking. Our only issue was the driveway. We felt unsafe turning off of the the road on to the driveway. It was somewhat of a blind turn and we felt unsafe turning in. Aside from that it was perfect. The downstairs area was great for the kids and the creek was amazing. The cabin was located close to town but far enough away to get the full relaxation experience. Cabin was very cute! Private and quiet location while still being relatively close to town. I'll definitely bring my family here again. 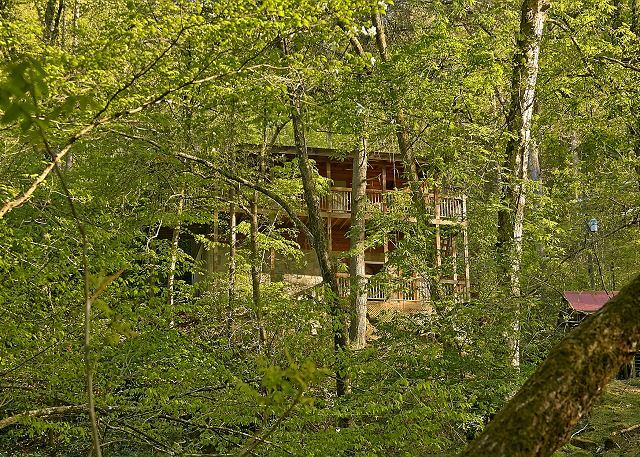 The location was perfect and we love the area of the cabin. Overall the stay was a good experience, very relaxing. Everything is was a conveneint commute. Great location, right on the creek. Lots of stairs to get to top level but the view from the deck makes it worth the climb. Hot tub worked great! Few spider webs and some dust but it was nothing worth calling in over as it is not the owners or the rental companies fault. Beds were comfy and WiFi was on time. Patricia at Aunt Bugs was terrific help getting booked. Nothing but great things to say! Would love to stay here again! The house was very clean the family love the house. My only concern was the water pressure. And at night it's hard to find the house from the main road. The staff at Aunt Bugs were very friendly, welcoming and inviting. They made sure we got the best price possible. The cabin had one toilet that ran constantly other than that everything was fabulous. Abundance of laughs and relaxation . Amazing is the best word I can think of, I have NOTHING negative to say about anything about the cabin or any other experience I had while I was there. If your even considering doing it, DO IT!!!! It is so peaceful, relaxing, serene surrounding!!! Turn the alarm off and WING your stay. The locals are wonderful, there is a ton to do in close proximity to the cabin... I recommend Alpine Coaster, The Island, there shops are so cool!!! Paula Dean's, OMG.... Jayell's Ranch....what a great rounded experience!!!! Enjoy!!! 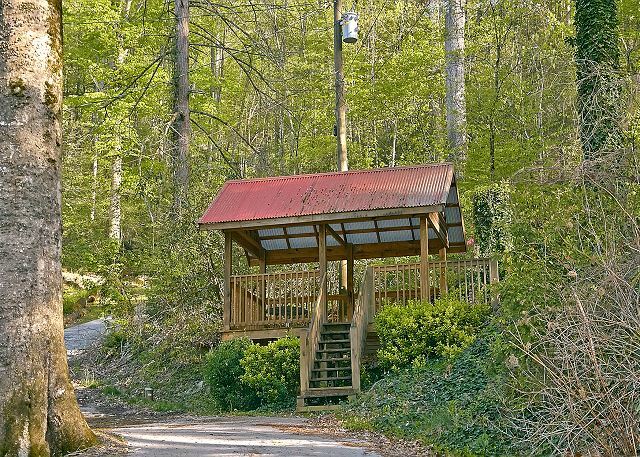 Cute creekside cabin, 2bd 2 ba closely located off Pigeon Forge strip but far enough to enjoy a peaceful tranquil creek. Maintence responded promptly to our request in help lighting the living room "wood stove/ furnace". Awesome service! Love the Aunt Bugs apps! Will definitely use Aunt Bugs again for our next stay! We originally rented a cabin in Gatlinburg but we were scheduled to go up when the fires started. They moved us to this location and upon arrival I knew we would have a great stay. The facility was beautiful and very peaceful and even better than the pictures could describe. If I had one complaint it would be that the stairs were very steep and not very wide but that is understandable with a cabin like this. All in all a great experience and I will definitely book again! The cabin was very clean and comfortable. the lower level where the pool table is stay uncomfortably cold. Overall we loved it. Our family really enjoyed the creek side setting of this cabin. The water give it a peaceful and relaxing atmosphere. The rental was in clean condition and in a great location. We had a great stay. The only thing I would recommend is some kind of motion light on the side of the house. It is pretty dark when you walk from your car to the front of the house. Not a huge deal but a light would be helpful. My husband and I stayed at Whispering Waters cabin for a week. It was conveniently located close to all the activities. There is no mountain view but it was nice to overlook the creek. The cabin was clean and had everything we needed. The hot tub could use a little maintenance. Whispering Waters was a very nice cabin loved to sit out on the deck and listen to the water.was very clean,and very close to all the activities.really enjoyed our stay. Had a great time at this cabin. The sound of the waters of Cove Creek was great. This cabin was great just not designed for more than 2 adults and a child as it is cramped. The view and sound of the waters make up for a lot though. Returned customers and we definitely enjoyed our stay 2nd time around. Cabin is in an amazing location with a beautiful overlook of a creek running through the front very soothing and family oriented. Cabin does need some updating, but overall it was great. Staff is great and very friendly. Definitely will be back again and again!! Great cabin with a great central location! Office staff was very helpful and friendly and cabing was clean as a whistle, my wife and i will definately be a returning customer!! Overall we had a good experiences. I’m glad the hot tub was for the most part clean. I do have some recommendations for Whisper Waters cabin. The closet door handles were nice, but at the same time both me and my wife ran into them. Also it was kinda of weird how the bedroom and bathroom doors opened. It was a bigger problem for me in the room with the king size bed, I try to go into the kitchen at night, and bumped my head on the self next to the door. It was just at my level. in addition you might want to spray the cabin for bugs, spiders and ants. The creek view was nice. We also like having wifi. What’s a vacatin without the internet. LOL! The location was very convenient, to everything. Very nice cabin had every thing we needed. Easy access to every place we wanted to go. Amazing stay! Amazing staff! Amazing Home! Very clean and well maintained home. Read the reviews from other guest about their stay and ALL details from previous renters about lights, pressure washing, etc etc has been taken care of! Not one bad thing about this home or staff! We have been renting with Aunt Bug’s for about 2years now and every time we have had nothing but good to say about this rental agency. The cabin was a wonderful experience. It's such a different feeling when we stayed in a cabin in the mountains. This was our second stay with Aunt Bug's and I'm sure we'll be calling you again. The only issue was the floors were very dirty. They may forgot to sweep before our stay. Cabin was in excellent conditions,,clean,,beautiful. We loved it there,,wishing we could stayed more time.. The staff at Aunt Bug’s is top notch. Slways friendly and efficient. Our stay at Whispering Waters was just perfect! Nice location and a nicely furnished cabin. We really enjoyed the stay. The staff was great and very helpful. The cabin needed to be pressure washed. The outside and porches were quite dirty. The hot tub looked shady and the wife and I were scared to open it because the top looked like it was on its last leg. The cabin was a great size though. There was a latent cigarette smell, but that is what it is. We had a great trip and look forward to our next. This was our first time in the area and getting a cabin was a great idea. I do wish the check in process did not require going to the office. This was the most hectic part of our whole trip and could easily be handled online. It was beautiful , relaxing , quiet and very clean. The cabin was perfect and the customer service was impeccable. I will be back!!! Thanks for the memories!! Cabin was lovley. Very private and clean. Office staff was very friendly and accommodating. Everything was nice had no problems. Will try to see you again in the future! It was everything we needed for an enjoyable, relaxing stay. I would most definitely stay again. My second time staying at Aunt bugs cabin rentals and I don't have anything negative to say cause I always look forward to making more memories with them. Cabins are clean the people are friendly couldn't ask for much more than that. Everything about the cabin was just as we expected. The wildfire event occurred during our stay but we were relatively safe. Our cabin was just right for us. It's close enough to town but away from the noise. The sounds of Cove Creek in the front yard are so relaxing. Check out was a breeze. Kala is awesome! Our stay was awesome! The cabin was spotless. Thank you. The staff at Aunt Bug's strives to meet every need. They are awesome! The staff at Aunt bugs were very friendly and welcoming. The app made check out a breeze. We will use Aunt Bug's for our next cabin rental. We were very pleased with the friendly staff at Aunt Bug's. Beautiful cabin. Wonderful staff. Awesome trip. Aunt Bug's is the best! We were very pleased with our service and cabin had a very good time! Good Service. We had a Great stay. Very Relaxing with the creek in front. The sound of it was great. Thanks!